Today we got lunch from the sushi bar at Whole Foods for $9.52 with tax per serve. Tonight we use the sous vide machine to cook pork chops from our Prather Ranch meat deliver to a perfect medium rare then fried them off for appearance and some Maillard reaction on the surface. 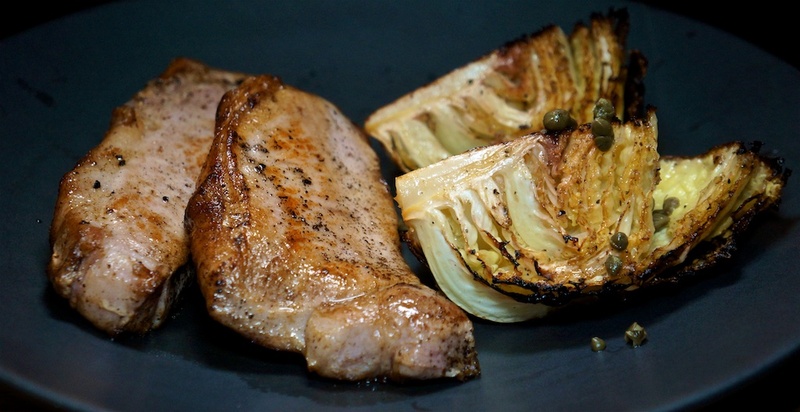 We served with roast cabbage with lemon and capers, which is a new recipe for us, but turns out to be a good one. Add 50c for butter, capers and sundry ingredients. The roast cabbage was better than expected, particularly the near-charred outer leaves. As expected the pork was really good. All up a great meal for $11.85 per serve. A last minute discovery of a complete lack of bread led us to The Country Deli for lunch. Foodie Philip had the usual marinated skirt steak with home fries and over easy eggs, while Greg had a Pastrami on Rye with coleslaw. Lunch cost $21.62 per server (average) with tax and tip. 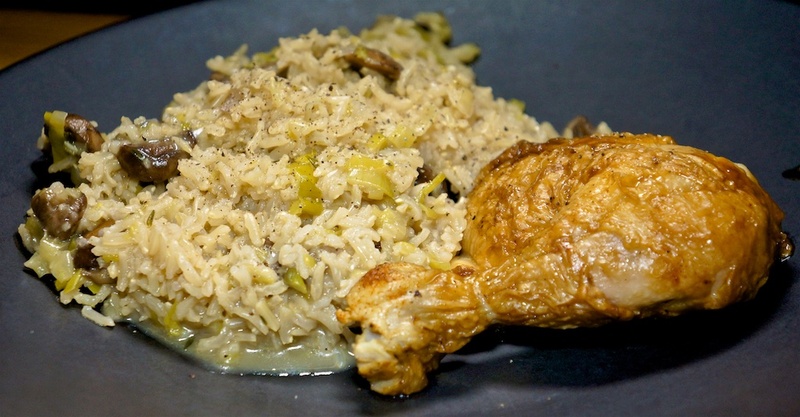 It was time to use up the remaining BBQ chicken from last week’s supermarket visit, and what better to serve it with than a tasty rice pilaf with mushrooms and thyme. Add 20c for the seasoning. Tonight’s meal was perfectly serviceable. The rice pilaf had mushroom forward but the thyme was completely lost. A decent meal for $3.66 per serve. Having explored it online, we decided to try frying off bacon in the panini press before adding it to sandwiches. It worked great on our bacon and tomato, and baked beans, cheese and bacon toasted sandwiches. The bacon worked well and enhanced the sandwiches that cost $2.21 per serve. 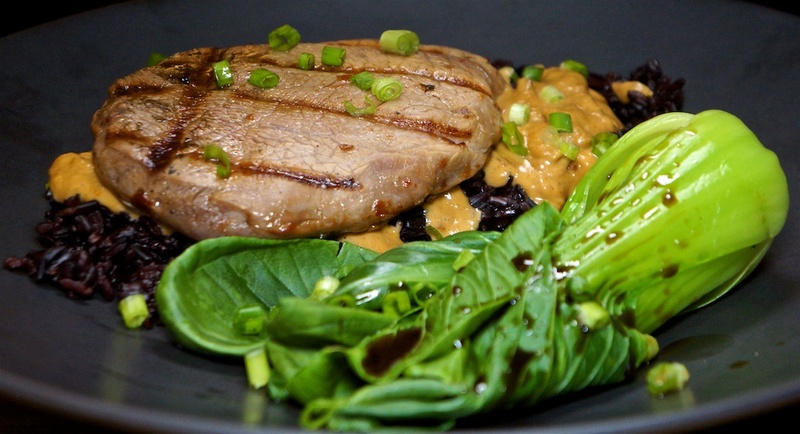 We were going to cut the sirloin into pieces for satay skewers, but since it was split into two portions anyway, we grilled it as full size pieces and served with the satay sauce on a bed of black rice. We added a bok choy each for some green! Black rice adds 40c per serve. A really good meal for $5.05 per serve. More toasted sandwiches. A salami, sun-dried tomatoes and labné repeat and baked beans with cheese as a new option. Baked beans and cheese are a staple in the Australian jaffle making scene. Trader Joes Giant Baked Beans in Tomato Sauce cost $1.99 and we used half or 50c per serve. Add 30c for labné and butter. Today’s lunch was satisfying and tasty for $2.22 per serve. We met up with a friend at our favorite Thai restaurant – Krua Thai – and shared roast duck, eggplant and pork and tom ka gai. Tonights tom ka gai was notably creamier and tastier than previous visits, perhaps from the addition of kefir lime leaves into the mix? Tonight’s meal cost $14.00 per serve. More sandwich experiments or repeats. The smokey eggplant salad is a new to our roster but it’s tasty. Add 20c for the labné. The smokey eggplant salad worked well in a sandwich just with sliced cheese, and the corned beef and cauliflower pickle is a step up from corned beef and sauerkraut. A good lunch for $1.93 per serve. The “Green Pork Chili“that we had a few nights ago was more “pork pieces in a chili tomatillo sauce. After eating all the pork, we were left with a flavorsome, spicy sauce. Add some ground pork and a can or two of beans, and now you have a chili! Two cans of beans add $1.98 or 50c per serve. The refreshed chili was really impressive. It retains a deep pork flavor from the slow cook previously; the ground pork adds texture and more pork flavor and the green sauce has a perfect amount of heat. We wondered if you could “beef up” the porkiness! A good bowl for $3.34 per serve. It’s not quite a Chinese meal, but a Vietnamese Bahn Mi is close, and was a good as it always is for $8.50 per serve. We call it a “grazing” meal where we nibble on a variety of cheeses and meats. Foodie Greg put together a platter of liverwurst, stilton, caramelized onion cheddar, grapes, dried apricots, truffled almonds and a Spanish style three meat platter with small amounts of salami, parma ham and chorizo. With leftovers it’s hard to calculate the exact cost, but we had more than we could eat for about $7.75 per serve. Although we wanted a change from toasted sandwiches, we still used the toaster to make “fry bread,” which is a single slice of bread buttered both sides in the sandwich press. 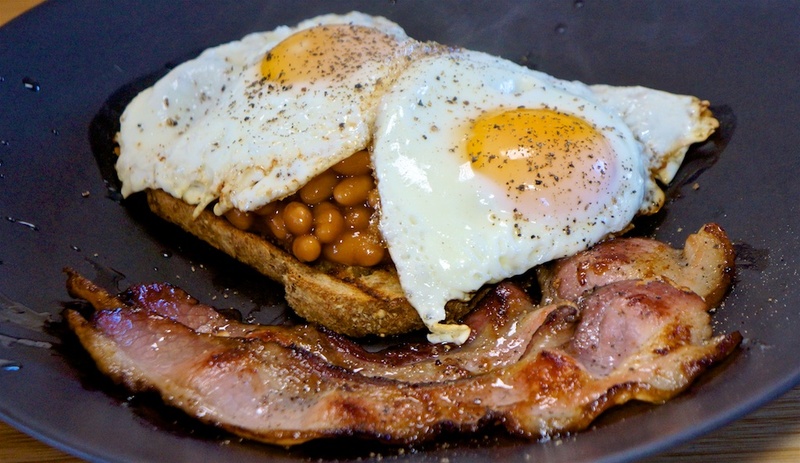 We topped with traditional baked beans, bacon and fried eggs. Baked beans are 75c per serve. Lunch today was a tasty deviation from our toasted sandwiches for $3.04 per serve. Lunch is featured in today’s image. The Foodies were invited to a friend’s place for Christmas Eve dinner in what has become a tradition. We were served traditional German beef stew, rice and chocolate mousse, all of which were great. There was no cost to the Foodies. We used the second chicken breast from our supermarket chicken and warmed it in the sandwich press after slicing it. It then was shared across two toasted sandwiches: one with Swiss cheese, the other with a smokey eggplant salad from Jon’s. The chicken is $6.99 and we shared one breast or 88c per serve across two half sandwiches. 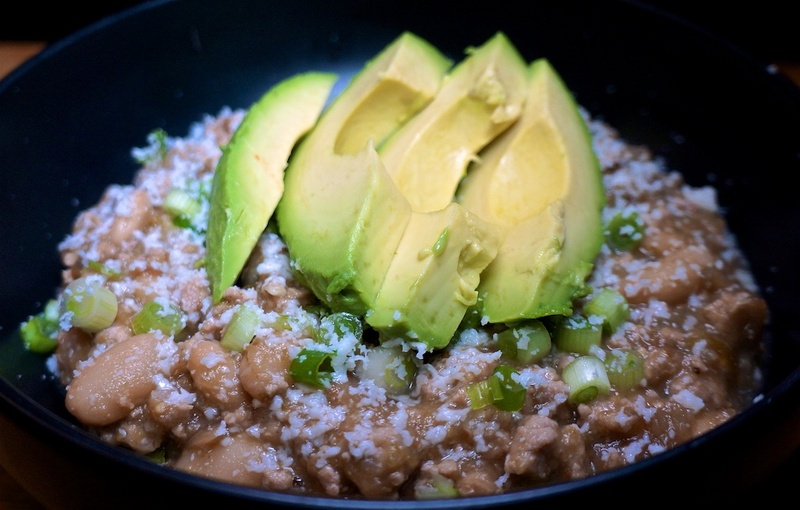 Green Pork Chili is a new recipe for us, and a perfect way to use the “cubed pork” in our Prather Ranch meat box. Consisting of odd sized offcuts, it had good fat and connective tissue that made it perfect for this type of slow cook. It was also the first time we’ve cooked with tomatillos. There is about twice the sauce as the recipe called for, so we’ll probably use it again. Tomatillos were $1.69 or 42c per serve. Dinner tonight was really tasty with a little spicy kick to it because we left the seeds on. The pork was perfectly tender and unctuous. We served with brown rice instead of flour tortilla’s for a total of $7.10 per serve. Today’s toasted sandwiches were: Labné and Cauliflower Pickle, and Swiss cheese with corned beef. Lunch today was satisfying for $1.79 per serve. 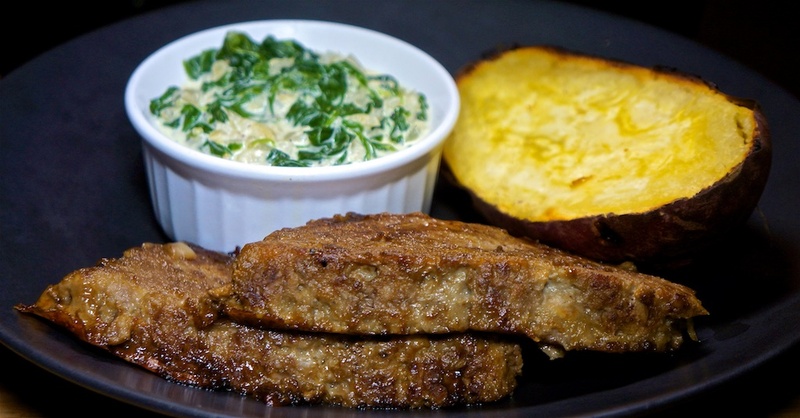 Time to fry off the remaining French onion meatloaf and serve it with creamed spinach and a Japanese sweet potato. The Japanese sweet potato has white flesh that remains firmer when cooked and is not as sweet as an American sweet potato (or yam). Add 30c for onion, garlic and seasonings. Dinner tonight was pretty tasty with the Maillard reaction on the meat adding extra flavor. The sweet potato was not as sweet and took the butter from refrying the meatloaf well. The enormous amount of spinach cooked down to a generous, but not outrageous serve. All in all a well balanced flavorsome meal for $6.12 per serve. Today’s toasted sandwiches were repeats: Cheese and Cauliflower Pickle, and spicy labné with corned beef. Add 20c for the spicy labné. Lunch today was satisfying for $1.89 per serve. A cold night calls for a warming curry! 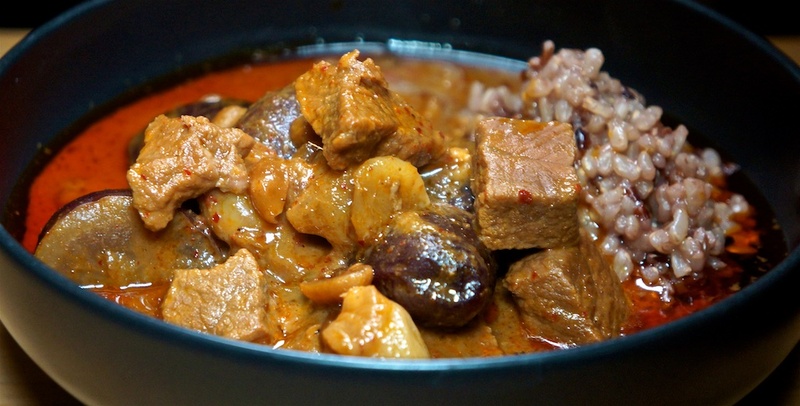 Beef Sirloin steak still in the freezer from our meat delivery, so beef massaman curry hit the spot! We use a curry base we buy from Amazon for this simple, quick meal for two. Tonight’s dinner was $7.37 per serve and very tasty, as always.